This film is truly terrify, with an extremely disturbing plot. The plot centers around a doctor, Robert Ledgard but who has a morbid fascination with skin and a great interest in drastic altering people physical appearance. His daughter becomes the victim of a sexual assault, deeply distraught and severely unstable she takes her own life. Dr. then decides to kidnap Vincent the perpetrator of the assault, and subject him to a series of bizarre medical experiments. Vincent’s whole anatomy is physically altered and he is shaped in the image of Ledgard’s deceased wife and renamed, Vera. Vera is held in captivity for years, and kept under close surveillance by Dr. Ledgard who begins to obsess over her. Vera tells him that she loves him and couldn’t live without him, but is she telling the truth? Watch and see, this is one of the most imaginative horror films ever, it borrows ideas from the classic “eyes without a face” but makes them much more horrific. I really felt trapped and horrified while watching this film, takes the maniacal doctor idea to a whole new extreme. The ward tells the tale of a group of women in a mental institution who are terrorized by a ghost residing with in the hospital halls. A newly admitted woman, begins to notice a series of strange happenings within the connfines of the ward. After questioning the other four about events, it soon becomes apparent that the girls are hiding a deep dark secret. Once their secret is revealed the plot thickens and a strange twist occured which completely caught me off guard taking the film into a darker setting. The film uses unique techniques and excellent use of music in creating a frightening atmosphere. Overall I enjoyed this film, the story itself seemed a little lacking, however the technical aspects of this film made it an enjoyable watch, along with the fact that I really enjoyed watching almost all of Carpenter’s previous films. This film tells the tale of Chris Cleek a man who captures a woman in the wild who lives a very savage existence. She behaves and almost looks very animatistic and dwells in a make shift cave within the wilderness. He takes her home, cuffs her and keeps her in captivity. The woman is subjected to a series of crule and unusual punishments at the hand of Chris and his son Brian who displays very disturbing misogynistic attitudes towards women obviously learned from his father. The story climaxes when Chris’s daughter Peggy, frees the woman, who in turn gets revenge on her captors. The film takes a strange twist in which evidence of more extreme cruelty has taken place. An excellent horror film with excellent acting and good production value, highly recomended to fans of well produced horror films. Also make note to stay tuned for the entertaining short which follows after the feature credits. I’m hoping that the killer woman becomes a new trend in horror film production, it would be nice to see more films with women commiting the violence rather than being on the recieving end of it. The Last Circus is a landmark achievement in filmmaking history. This is seriously one of the best films i have seen recently. 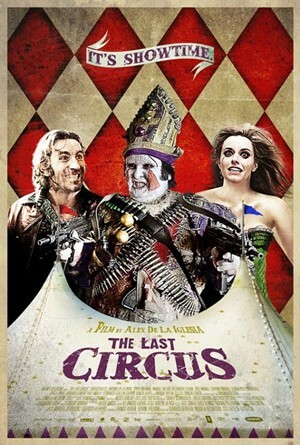 It a bizarre, violent drama about a cast belonging to a circus in Madrid. The plot centers around Sergio the happy clown and Javier the sad clown, and their love of the beautiful and talented acrobat Natalia. Tensions rise and what begins as a few scuffles, ensues into a violent outburst by Javier, in which he beats Sergio repeatedly in the face with a trumpet. Javier flees, leaving Sergio behind barely alive and badly disfigured. At This point Javier’s character undergoes many serious changes, in which he literally behaves and acts as an animal, thus becoming a deranged maniac. Javier, disfigures his own face and makes a new costume which looks like a demented pope. He soon returns, to make a “declaration of love” to Natalia, whom is horrified by the new makeover. A bloody battle between Javier and Sergio follows. Visually stunning, very well written and well acted, push the film into to the ranks of classics. This film is bound for cult status and will be talked about for years to come. Do not let the title mislead you, this film is awesome. Saturday the 14th is the ultimate homage to popular horror movies. It features many iconic monsters and makes reference to many popular horror films. A young boy discovers “the book of evil” when his family moves into a new house they recently inherited, unknowingly the boy releases a wide variety of monsters after reading verses from the book. After experiencing a series of strange occurrences and getting a serious case of bats in the attic, the family enlists the help of Van Helsing. A battle between Van Helsing and a Vampire break out for possession of the book. 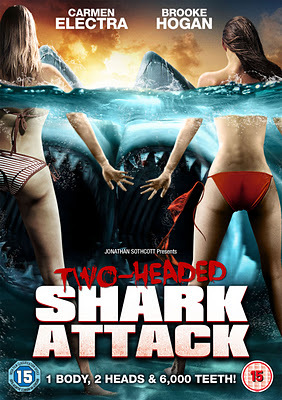 Ultimately this is a comedy movie, it features many monsters but none of them are scary and none of them kill. This is a very harmless light-hearted film that can be enjoyed by many. It’s still a b-movie, but it has the sensibility of a family film. Death comes ripping, again!!! The Final Destination series has never failed to let me down, it seems that these films have progressively gotten better, and bigger. I was sold on this film from the beginning which shows a large bridge undergoing maintenance collapse, killing hundreds. It starts the same as any other FD film, a group of friends cheat death due to the premonition of an on coming disaster. In this case it was coworkers taking a bus to a weekend retreat about to cross the bridge that is under construction. Like always death comes back for them one by one in the order they were supposed to die. Some of the deaths scenes in this film are more innovative than some of the previous efforts, all are extremely violent and gory as is always the case with these films. Most of the characters are portrayed in such an ugly manner that you can’t wait for death to catch them, while others are depicted as wholesome characters who you would like to see escape the clutches of Death. If you are a fan of the franchise this film will not let you down, I’m pretty sure this is my new favorite FD film. 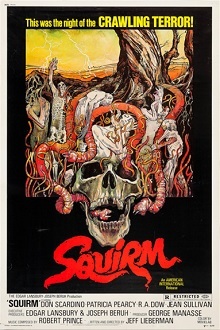 Squirm is a brilliant example of the eco terror film in its finest form. A thunder and lightning storm causes power lines to fall, over which results in 30,000 watts of electricity into the wet soil. Coincidently this happens to be right near a local worm farm. The jolts of electricity cause the worms to raise to the surface with a thirst for human blood. Before long the worms take over the quite town of Fly Creak in Georgia. The worms burrow their way into your skin and eat you alive leaving behind a clean skeleton. 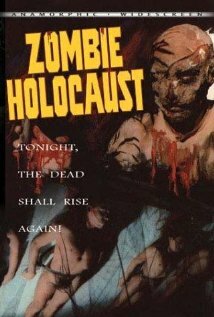 The film has a few scenes contain mild gore, but nothing too extreme. The scenes of the worms themselves sent shivers down my spine, due to my worm phobia. The perfect blend of comedy, horror, and camp, this film is sure to satisfy all your movie viewing needs.